Asparagus are only in season for a very short time. 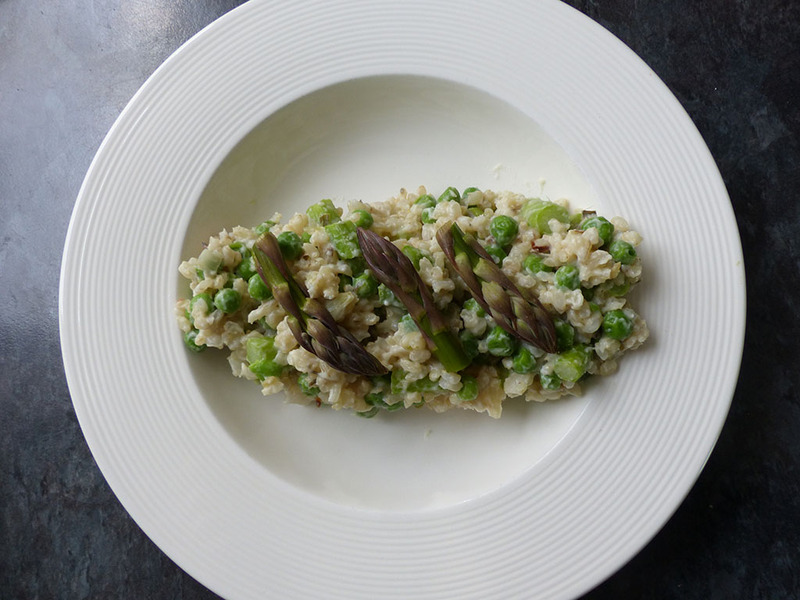 British grown asparagus is really only available in May and June, so make the most of it! In a pot or large frying pan add a bit of olive oil and sauté the onion and garlic slightly, without colouring. Turn up the heat and then add the rice. The rice will now begin to lightly fry, so keep stirring it. Add the wine and keep stirring for 2 more minutes, until the alcohol smell evaporates. Once the wine has cooked into the rice, add your first ladle of hot bouillon. Turn down the heat to a simmer so the rice doesn’t cook too quickly. Keep adding ladles of bouillon, stirring and allowing the bouillon to be absorbed before adding the next ladle full. Taste the rice, and when it is almost ready, add beans and asparagus and continue to stir. Continue with the final ladle of vegetable bouillon. When the rice is ready, remove from the heat, add Violife Prosociano and Violife with Herbs, salt and pepper to taste, and stir continuously until the cheese is fully absorbed and it transforms into a wonderful creamy risotto. Serve immediately, adding freshly ground pepper and fresh asparagus on top.